Who this document is for: Matomo Super Users and Administrators that need to allow other people to view Matomo reports. 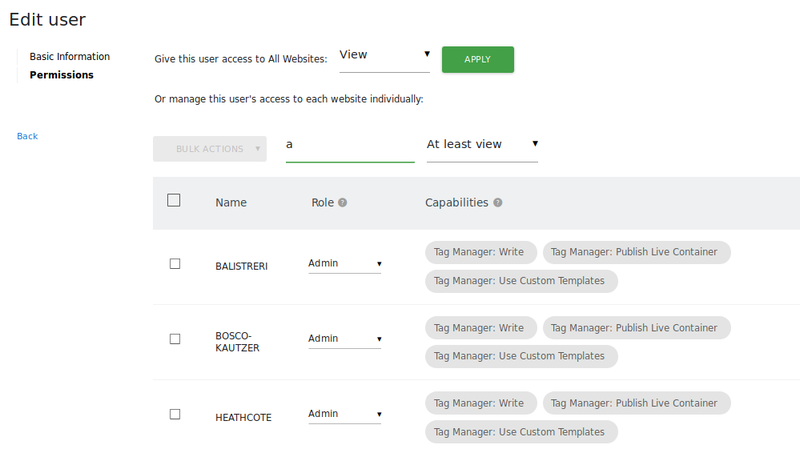 The Manage Users screen lets you add, change and delete Matomo users. 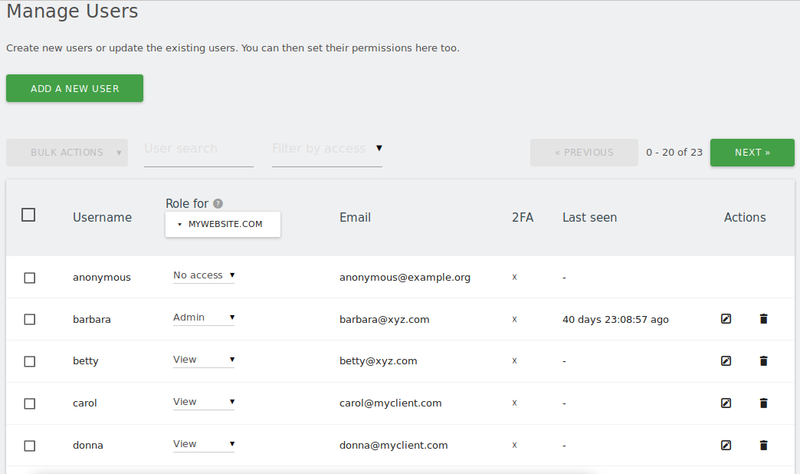 Additionally, you can search for users, change user details and manage what users have permission to see and do in Matomo. If everyone in your organization should be able to see and edit the same reports for the same websites, then you might wonder why it’s necessary to create multiple users. Why can’t everyone just use the same account? Every user in Matomo is separate; they each have their own user settings and they can each create their own dashboards. Having multiple user accounts allows individuals to customize their Matomo experience to suit their priorities and needs. For example, someone from your marketing department might create a dashboard to focus on how people are getting to your website, while the website manager may be more interested in the website’s goals and conversion rates. Additionally, it’s far more secure to have multiple user accounts with only the permissions they need to have, rather than one or a few accounts that can do everything. If an account is ever compromised, it helps to limit the damage if that user isn’t allowed to see and do everything. Roles determine what a user can and can’t do. 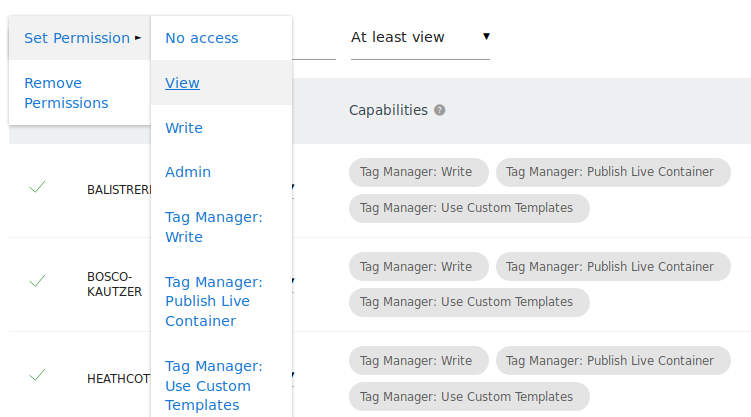 There are currently four predefined roles in Matomo: View, Write, Admin and Super User. The View role allows a user to see reports for a website. The Write role is the same as the View role, except the user can also create (and update and delete) a website’s Goals, Forms, Funnels, A/B tests, Heatmaps, Session Recordings, etc. if they desire. The Admin role is one step above the Write role in that it allows a user to both see reports, configure those reports and the website itself, and also manage user access for the specific website. The Super User role is the most powerful role and gives the user the ability to do anything to any website, as well as enable/disable plugins and set global system settings. With the exception of the Super User role, all roles are tied to a website. So a user could have View access to one website and have Admin access to another. This means you can more precisely decide who has access to what. 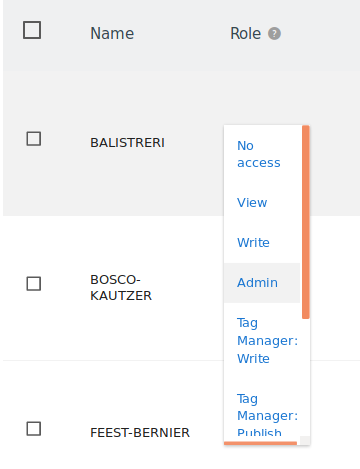 You can access the Manage Users page in the administration area by clicking on the Users entry in the left menu. How you manage users depends on whether you are an Admin user or a Super User. Super Users can see every user, change any user they want to change, and delete any user they want to delete. Admin users on the other hand can add new users and can change a user’s role for the websites they are administrators of, but nothing else. 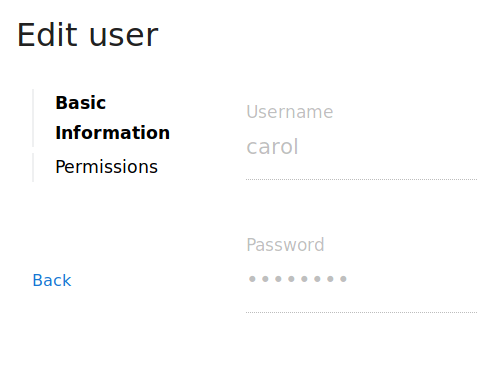 Once created, the form will change to the Edit User Form, described below. You can create an unlimited number of users and give them access to one or several websites. 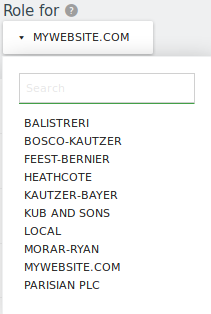 As an Admin user, you can only see other users that currently have access to one of the websites you are an Admin of. So it’s entirely possible that the user you want to give access to already exists. 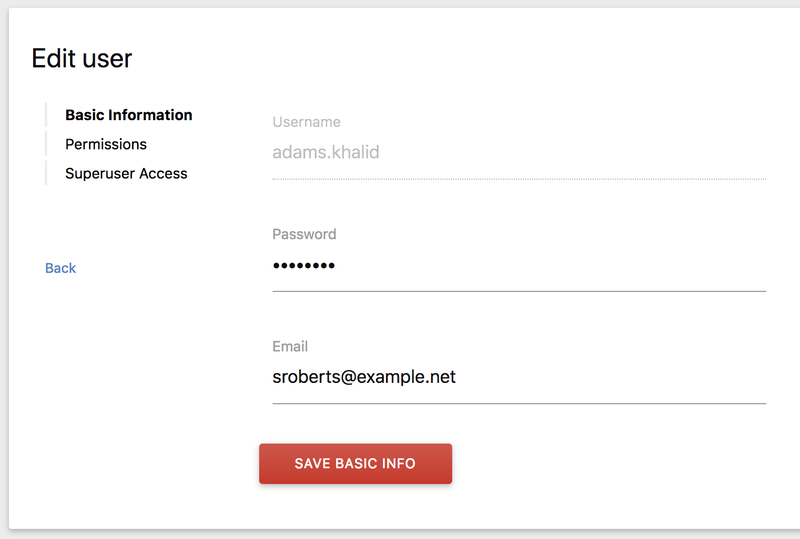 In the modal, enter the user’s username or email address and click Add. 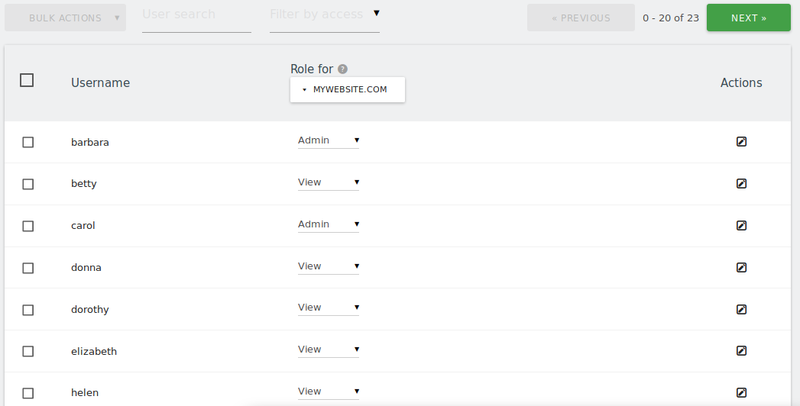 This will give the user the View role for the website currently selected in the Role for column. 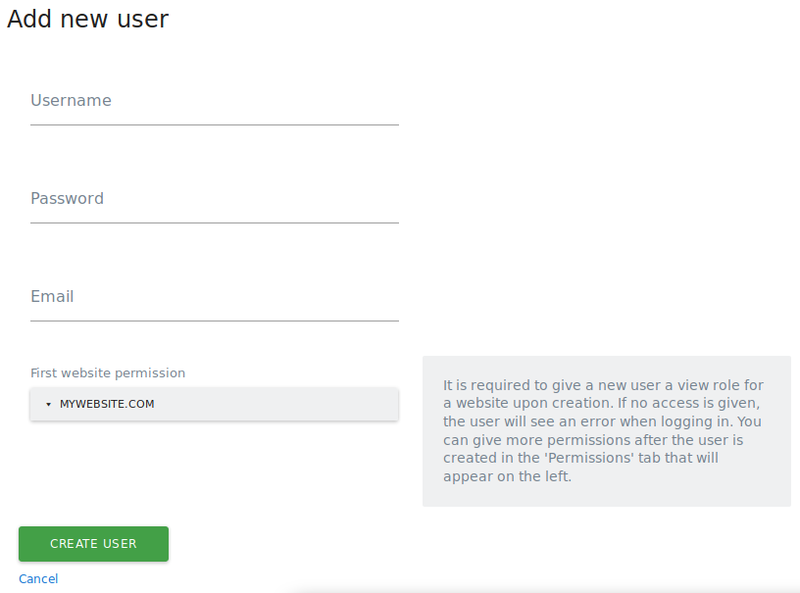 Once created, the form will change to the Edit User Form, described below. You can give or remove Super User access simply by checking or unchecking the checkbox. 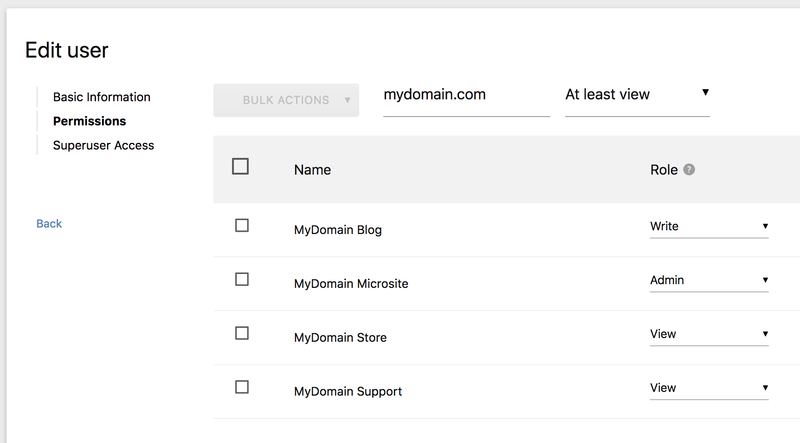 You can use Matomo (Piwik) APIs to create, update, and delete users, and set permissions. This is useful to integrate Matomo with your existing customer websites automatically. Many Matomo users track hundreds or thousands of websites this way. What is the ‘super user’ in Matomo (Piwik)? What is the ‘admin’ permission in Matomo (Piwik)? What is the ‘view’ permission in Matomo (Piwik)? 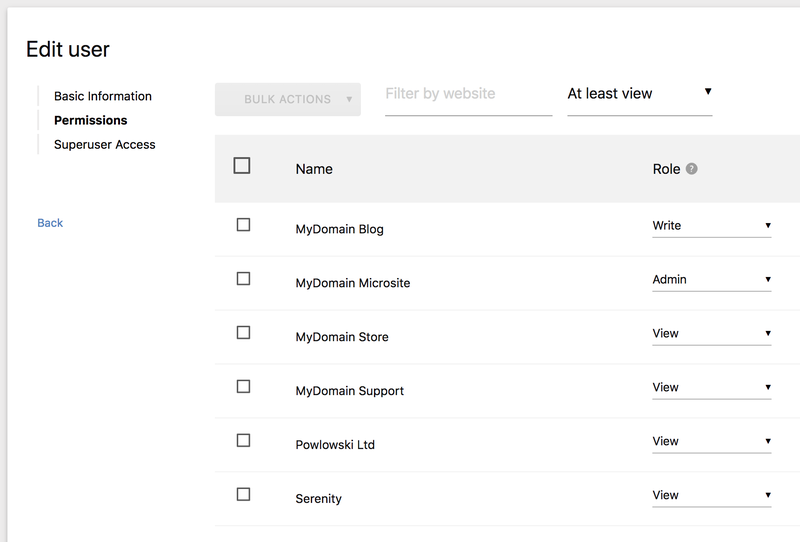 Click here to play the video walking you through the Matomo (Piwik) Settings: Manage Users, Websites, Privacy, Optimize your Database, General Settings.